Wedding season is in FULL force right now! It seems like everyone I know is getting married! 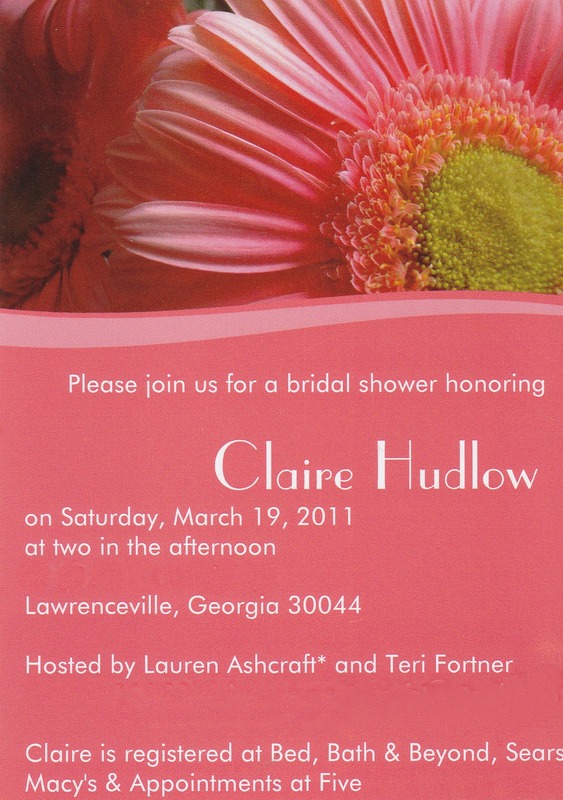 Timing couldn’t have been better, while I was planning my trip I got an invite in the mail for Claire’s wedding shower. That was the deciding factor about me coming up that way – it was like fate that I should be there! Another friend from high school, Lauren, was hosting and I was looking forward to getting to visit so many friends at the event. Isn’t the invite beautiful??? The shower was at Lauren’s mom’s house and her home is so pretty! It cracks me up because Lauren and her hubby (Jacob…who I actually dated for a couple months after high school! Small world huh?) have only been married for a couple years but Lauren’s mama is READY to be a grandma! She even has a nursery all set up and decorated, she reminded me of my mom and we clicked right away. Lauren and her mom did a great job decorating for the event and had some delicious food for everyone. They MADE these, can you believe that? I LOVE the pitcher idea, it says “Advice for a pitcher perfect marriage!” Isn’t that cute? And the homemade cookie favors were beyond tasty. I snacked on mine on the way home the next day. I wish I was half as creative and skills as these ladies are! discussions. I miss life back then! Claire sang in my wedding and I’m so offended that she didn’t ask me to sing in hers…haha YEAH RIGHT. Don’t we look SO skinny in this picture? Whoever took it is my new best friend! I LOVE IT! When I got to the shower I was early so I drove around for a bit and decided that after the shower was over I wanted to swing by my childhood home. I know it’s kinda lame, especially since I drove by it last April when I was in town, but I just enjoyed driving through the neighborhood. I stopped by my apartment, where I lived through high school, and then drove down the street I grew up on. You know when you dream and your dreams are often at the same place? My “home” in my dreams is always this house. I can remember every single detail of it and miss it. I’m excited for the day that our new house becomes the home in my dreams, but our Saratoga house will always be so special. Once I got back to Kelly’s we decided it was time for a GIRL’S NIGHT! We both needed it and enjoyed it SO much. I am so thankful that the blog world brought us together. I admire Kelly in so many ways. She has such a beautiful way with words and has such a deep passion for the Lord. She’s a little older than me…but like 10 years more mature than I am! It’s a blessing to have a friend who helps me grow spiritually and who I can talk and talk and talk with. And this was only our third time ever seeing each other in person haha. We ate at Provino’s which is my ALL-TIME favorite restaurant then we hit up Bruster’s and I had the chocolate chip coffee ice cream. Which I’ve been craving ever since. It was so, so yummy. It was good to get Kelly off her pregnant booty and out of the house for a night on the town! We had a blast and I’m ready to visit again soon 🙂 Maybe she can sneak away for a visit my way! Sunday morning I hit the road pretty early so I could meet up with one last friend on the way home! When I put it on Facebook that I was coming up that way I was pumped when Larissa (our newest blogger!) contacted me and said she lives in-between Valdosta and Atlanta. Right on my driving path! How perfect is that?!?! I have seen her in passing since high school but haven’t actually hung out and it was wonderful! We met up at the Denny’s at Locust Grove so I could do some shopping at the outlets after (I got some GREAT deals on a bathing suit and shoes for Kye!). That place was jammed packed. Like I had a 20 min wait when I got there…for Dennys! Are you kidding me?!?! I guess it’s like the only place to eat there. Haha! You know how some people peek in high school? Like they are SO pretty in high school but then seem to get worse looking with time? Larissa to me has just gotten more and more pretty as time passes. I see her pictures on facebook and I feel like a lesbian saying how good she looks on all them but it’s so true! She’s newly engaged and will be SUCH a pretty bride, don’t you think? I’m hoping next time we drive through we can get together again and that she can meet Kye (and Zach too of course) and that I can meet Matt! I headed home after my little shopping excursion and while I was looking forward to seeing Zach and Kye (Kye had a BLAST with Gramma for the weekend! ), I was also a little sad. Don’t get me wrong – I am really learning to LOVE Valdosta and I have SUCH amazing friends here. I’m not complaining one bit about anything…but going home made me miss home. That’s normal right? I know we’ll never live up there and I don’t want to (um Central Gwinnett was rather ghetto back when I went there…I’m sure it’s reeeallly rough now!) but I still miss it and really enjoyed my Emily time! Just driving, listening to music, seeing my friends, doing whatever I wanted. I think it’s a great thing for mommies to get some time away to stop being “Mommy” and get to be themselves! It really gave me a fresh outlook on things and made me a better wife and mommy when I got home. I think Zach felt the same way about his weekend with Ryan – but we were both eager to see each other and get our little family back together at home! Hopefully it won’t be too long until I do another weekend like this again. And all of you that I didn’t get to see I hope we can get together the next trip – I also live off 75 if you ever head to the beach or Disney World STOP BY and see me too!!! Previous Post VOTE for a New Giveaway!! !